The following posters were presented during the Smart, Local, Resilient meeting. Click each title to see the full poster. The University of Illinois at Urbana-Champaign has collaborated with US Ignite, a 501(c)(3) nonprofit organization with original inspiration from the White House Office of Science and Technology Policy and the National Science Foundation, to build a living smart gigabit applications testbed in Urbana-Champaign that serves as one of the dozens of Smart Gigabit Communities in the nation. The goal of the project is to foster the development and deployment of next-generation innovative applications that leverage the high-speed internet network such as Urbana-Champaign Big Broadband (UC2B) and the rich human and technology resources in our community. We have been working with researchers and developers from the University of Illinois and the Urbana-Champaign community to develop applications focused on areas of national priority, such as, Health, Public Safety, and Education and Workforce Development. These applications will provide transformative benefits to our community and other communities in the Smart Communities Network. We have also collaborated with Midwest Big Data Hub to organize a Reverse Pitch Event that aims to enhance civic awareness of socio-technical issues, empower local change makers and idea generators, and develop the ecosystem for a smart local community. Local governments pressured by fiscal stress have long privatized public service provision to decrease costs or maintain service levels (Greene, 1999). While considerable research has considered contracting behaviors of ‘mature,’ urban and suburban communities for services which they already are, or are capable of, providing (e.g. Brown & Potoski, 2003), what happens in small communities faced with a rapid influx of population and resources? Do factors shaping contracting in larger, resource-constrained locations apply to expanding cities under conditions of opportunity? Are growing cities’ service options limited by a lack of existing capacity, or expanded by additional resources to allow innovative delivery arrangements? Using original data from over 100 North Dakota cities and counties in 2014, this paper models the impact of service and market-specific transaction costs, changes in resources and service demand, and other community factors on public officials’ choices among delivery arrangement modes when contracting out for local services. Purpose: To identify ambulance deserts within the state of North Dakota (ND) and propose alternative solutions for improving access and minimizing costs. Data The most current ambulance locations and the road network were obtained from the ND Geographic Information System (GIS) Hub. The 2010 ND population data originated from the U.S. Census. Methods: A national panel of ambulance service experts defined a 25-mile minimum access standard for ambulance services and detailed the financial resources required to run three ambulance service tiers based on population density. Services were located so that all ND residents were covered and living within the minimum access standard. Both paved and gravel roads were considered. A location set covering problem (LSCP) was used to determine the most efficient means of providing coverage. Services were sequentially placed in towns with over 8000 people, hospitals, incorporated towns, and paved roads. Sensitivity analyses within a GIS/economic framework conveyed the most cost-effective set of service locations within ND. Results: Compared to 134 existing services, an optimal set of 105 services covered the entire state’s population within a 25-mile service area. An optimal solution could realize system savings of $67m in fixed costs and $33.5m in annual variable costs. An estimated 1.2 billion people do not have access to electricity due to economic and environmental barriers that arise in conventional electrification. This project brings together electrical engineers, architects, community planners and artists to envision the development of an ensemble of tools and technologies for low cost, non-toxic, off-grid capable future household energy delivery systems. The research will integrate concepts from passive home design to develop a primarily-DC energy delivery system (unlike primarily AC systems, currently) while integrating photovoltaic (PV) and energy storage systems using next-generation low-cost, high efficiency, earth-abundant materials. If successful, the concept can help support the design of cheaper stand-off-grid residential systems in communities without access to transmission, improve the survivability of existing off-grid microgrids in the wake of natural or system disasters, and engage Native American communities from the Dakotas in the development of technologies and educational materials that deeply resonate with their inherent conservationist ideals. Substance use disorders have increasingly become a significant public health burden and a safety issue throughout the United States. This epidemic is now contributing to a rise in heroin use as well as a rise in Hepatitis C Virus (HCV) and Human Immunodeficiency Virus (HIV) outbreaks by the use of new drug delivery systems (National Institute of Drug Abuse, 2017). To address the spatial accessibility available health resources for the community, we developed a health resource inventory for Web and mobile App devices for the Grand Forks, ND area. The aim of this study is to using smart based applications, state-of-the-art technologies, and communication-based applications within the context of smart cities to design real-time health resources inventory that integrate medical information and treatment facilities that ensures fast, accurate and consistent healthcare information across the community. This real-time application can be used by Health and human services to identify the right services that meet their health needs and safeguard that the best treatment and assistance is provided. We show the significance of information technology in facilitating and shaping decision making in urban centers, and how the use of an integrated system can increase accessibility of information to better show how their cities work, allowing stakeholders to efficiently micro-manage the urban system with real-time information. Rural Northeastern North Dakota’s economic development increasingly includes tourism that generally focuses upon scenic amenities. Yet, cultural amenity-oriented tourism exists and is expanding, too. Uniquely, one form of heritage tourism is using waypointing and geocaching to inform people about local history and geography. Since the summer of 2015, waypointing and geocaching materials have been created for North Dakota’s Red River Regional Planning Council. 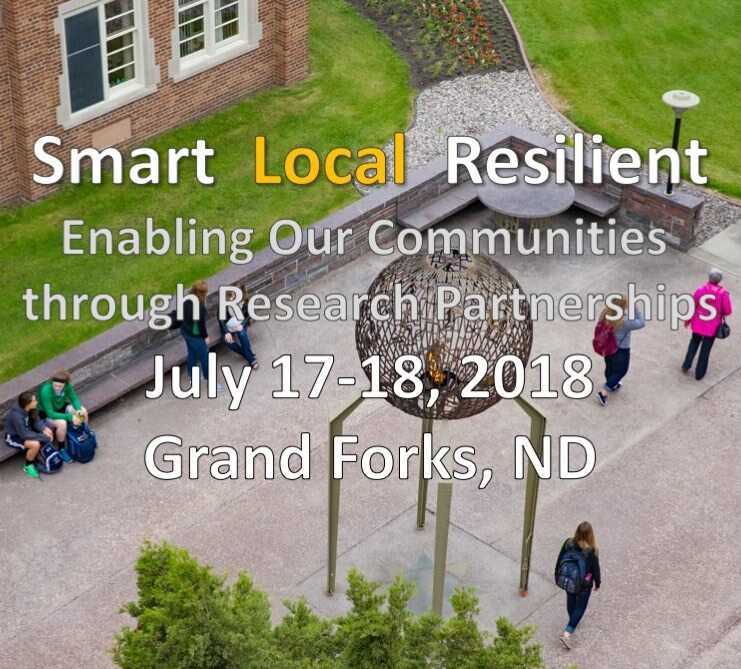 This collaboration involves the Pembina County Historic Preservation Commission, the Walsh County Historic Preservation Commission, the Dakota Science Center, and the University of North Dakota’s Department of Geography and GISc plus private citizens who are avid geocachers. This poster is focused upon presenting the methodologies used to investigate the assorted sites in the two counties plus follow-up activities that are ongoing. This type of heritage tourism was highlighted in the summers of 2016 and 2017 as part of the Red River Regional Council’s plans for promoting community-based approaches to visiting the area, notably to Canadian tourists, so to continue to diversify local economic development. Waypointing and geocaching activities for the summer of 2018 are well-underway, and more attention is being given to expanding this form of community development in this region of the Peace Garden State. One of the critical challenges civil societies face is coping with emergencies due to natural or human-created disasters, such as major floods, tornadoes, or civic unrest. This project investigated the potential for Big Data—harnessed through integrated and networked data resources, along with the proper analytics—to benefit preparation, response, and recovery processes. The project brought together leaders in disaster response at state, county, and city levels with data scientists to craft a plan to capitalize on existing data and to utilize previously untapped data for emergency response and recovery. Potential benefits include improved forecasting of incidents and their impacts, more efficient and effective utilization of resources, enhanced situational awareness during response, and improved planning for recovery. The project has developed a community of practice focused on data in resilience and incident response in several Midwestern states. Participating states include Illinois, Indiana, and North Dakota. The product will be a plan set to take this effort to the next stage, implementation of data resources for community resilience in the face of disaster and emergencies. 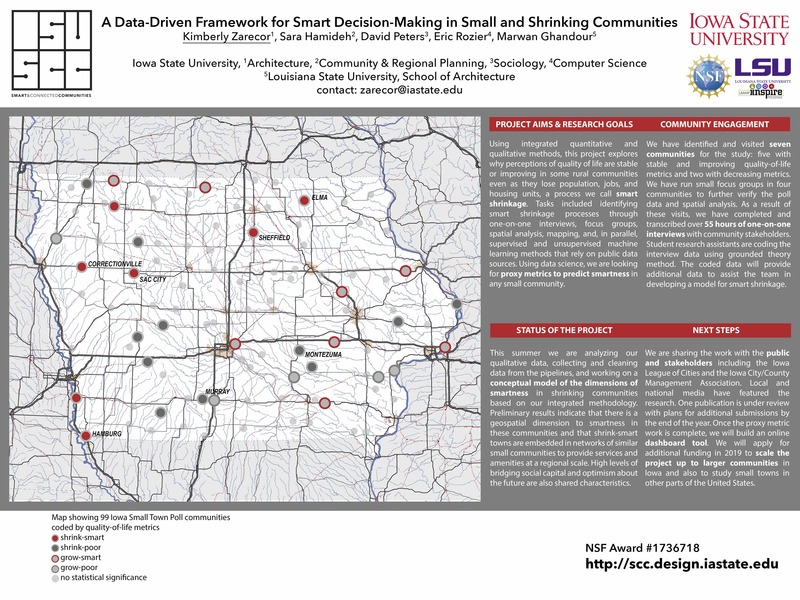 This poster presents a research project funded by the National Science Foundation about smart shrinkage in small Midwest communities. Many small communities across the nation have experienced shrinking populations, an exodus of younger people, job losses, and aging infrastructure since 1980s. While previous studies have primarily focused on documenting and observing aspects of decline or promoting uncertain growth strategies, the need to help shrinking communities to protect quality of life for residents and the infrastructure has been widely overlooked. Our project addresses this gap by developing data-driven tools to assist communities in actively planning for shrinkage. Our multi-disciplinary project team of faculty researchers and students brings expertise and data from architecture and urban design, community and regional planning, computer science, rural sociology, and sustainable environments. To understand smart shrinkage, we focus on shrinking communities that perform better than expected on quality-of-life indicators in the longitudinal Iowa Small Town Poll conducted by Iowa State University since 1994. Shrinkage is measured by faster than average population loss; and smart outcomes by faster than average quality-of-life gains. We then examine correlates of smart shrinkage using demographic, economic, social capital, and civic engagement indicators. Our findings indicate that embeddedness in a regional network of surrounding communities and services, as well as strong signs of different forms of social capital, play significant roles in shaping perceptions of quality of life in each town. Furthermore, we found considerable differences between our case studies with respect to the contributions of governmental versus non-governmental entities in responding to shrinkage and providing a creative vision for the future of these small shrinking towns.